Coding the greatest-kept secret of your age! Christmas, Present time - Modeled after The Da Vinci Code mystery film, "The Michelangelo Code" contest is our annual talent search across Canada to find the next Michelangelo; a student exhibiting the skills needed to depict our secret, the truth hidden in The Michelangelo Code! 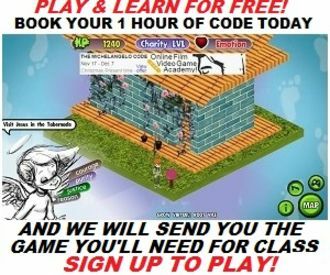 Founded by former webkinz.com game programmer and STEAM workshop Instructors, we aim to nurture, grow & inspire the spirit of Canada`s youth through a variety of ONLINE educational programs based on professional techniques used by our Team of professional developers who from around the world are producing "The Michelangelo Code" effectively & % completely over the Internet! Consisting of contributions from world-renowned artist(s) like David Pacheco, the former animator of Ariel from The Little Mermaid, prepare yourself at any grade level for a possible future as a professional online Instructor, or better yet, a fellow team member producing with the best of the best at our Studio Academy. Your FREE Preview into our Winter Term begins here! The Ghost of Christmas Future - Our former students are now grown up and able to work for us, teaching the next generation of students the same grade level skills learned from us online. Students who learned the higher grade level skills can now help us co-create our Masterpiece, literally CODED to unravel the best-kept secret of our times!